Following the success of our first blogger date night at Third Wave, Little Piggy and I were eager to meet up again promptly for round two! I was honoured to be returned my earlier gesture, by accompanying Little Piggy on her invite to try out the new Happy Hour tapas menu at Teppankai in South Yarra. This trendy, upscale eatery, hidden from the bustling Chapel Street, offers an all-round Japanese experience for diners with authentic as well as contemporary style dishes; along with the option of sitting around the open teppanyaki hotplates and receiving a live show from the skilled chefs, or having your own secluded group table either inside or within the al-fresco dining area. 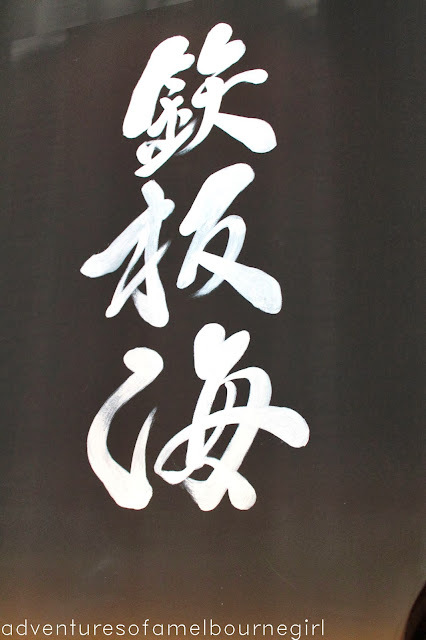 The Japanese theme continues throughout the interior decoration; the kanji art clad walls, coupled with the sombre colour palette and chill mood background music providing an ambience of Zen Buddhism and meditation. Our anticipated arrival at 6pm was kindly greeted by manager Richard Tan, who the led us over to a secluded dining area. 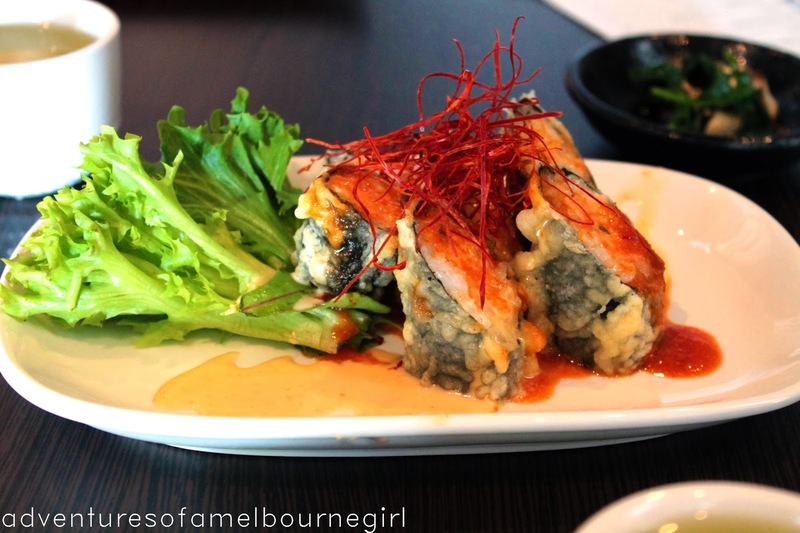 First out was signature dish, the Spicy Fish Tempura Roll. Ever a fan of the California sushi roll; this dish nailed it by perfectly matching the tender salmon with a lightly spiced and very creamy mayo, and snuggly wrapped up in a bundle of lightly battered nori. They may have been only bite-size, but these little rolls were full of flavour! To accompany our rolls, we were served a salad. 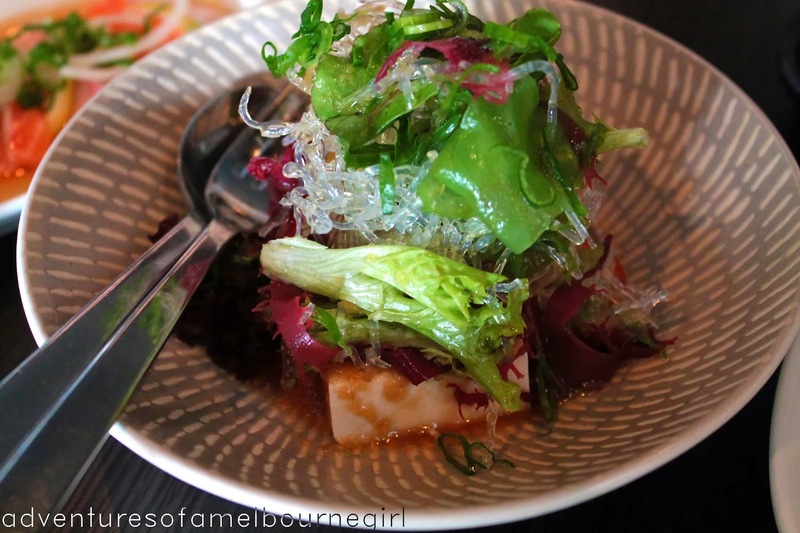 The tofu, hidden under a mass of wakame, was delicate and supple, and completely melted away in your mouth; while the dressing gave the wakame and lettuce salad a great tangy taste! Next up was the Italian-inspired Carpaccio. I found the house vinaigrette to be a welcome addition to the dish, as the acidity 'cooked' the salmon carpaccio and really gave something extra to its subtle and sub-dued flavours. A beautifully cool and understated dish that was also fall apart tender. 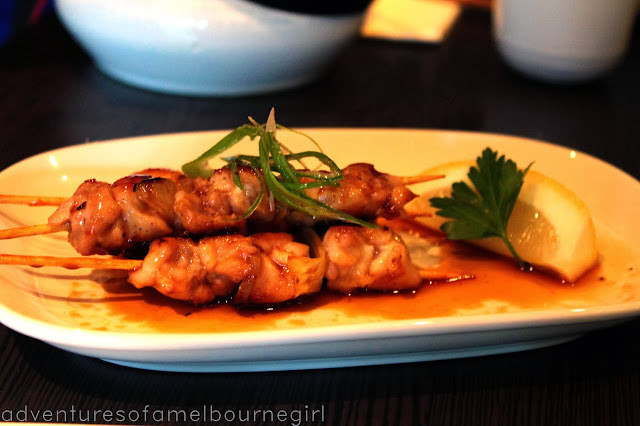 Of course, we couldn't have visited a Japanese restaurant without trying the traditional favourite - chicken teriyaki. Essentially, chicken skewers englazed in a rich teriyaki sauce that, when given a squeeze of lemon juice from the accompanying wedge, really hit the spot! However, I decided to leave the best until last. Oh my goodness - there was hands-down no denying the winning dish of the night. Just from the presentation alone, I could tell I was going to enjoy this. 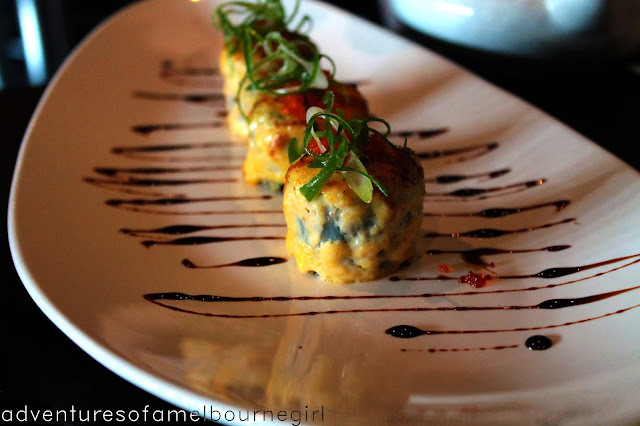 Let me introduce you to The Kai Kani Maki, little tender crab meat-filled rolls, snuggly wrapped up in seaweed and barramundi, drenched in a dollop of mayo, and then blow-torched and topped with a sprinkling of tobiko just to add the finishing touches. Talk about flavour that really packs a punch! 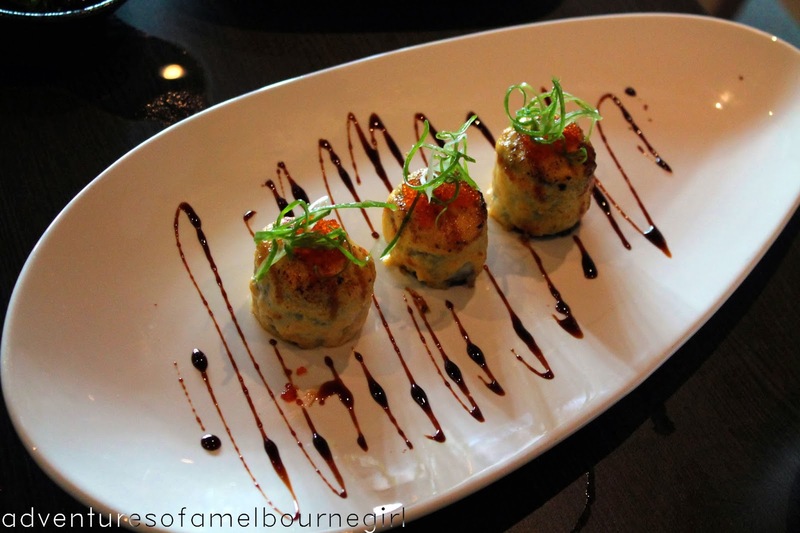 I couldn't have asked for a better first experience with tasting barramundi. These creamy flavour-filled bundles of goodness had us raving about them all night long! 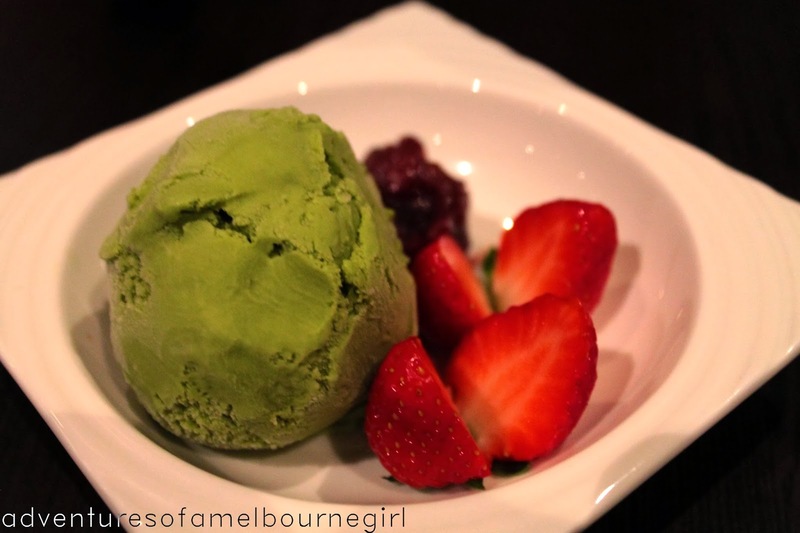 And to finish off the night, Richard offered us some dessert - a generous scoop of deliciously creamy and refreshingly light green tea ice cream complemented artfully with its red bean counterpart. 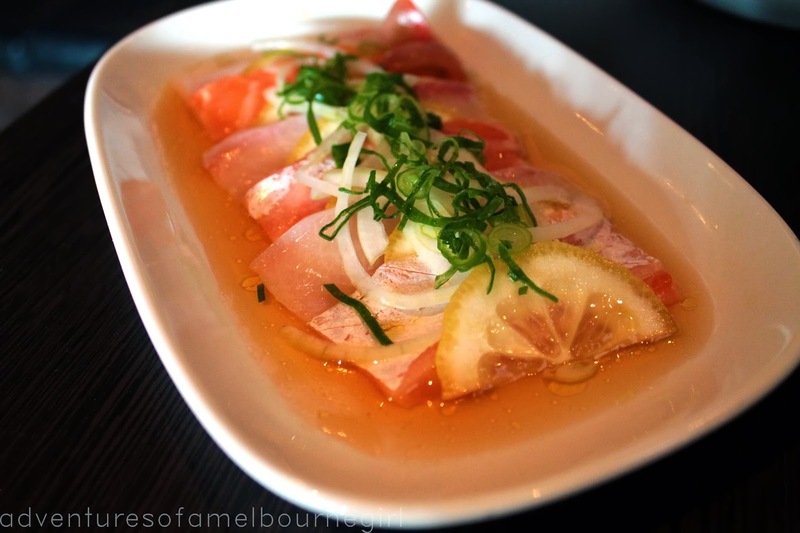 With such eclectic dishes and impeccable presentation, it was difficult to find fault with Teppankai. Certainly recommended for anyone who is looking for a whole new flavour experience!